With the launch of Windows 7 just around the corner, it’s enevitable that firms will start using the OS’ launch as a marketing angle. 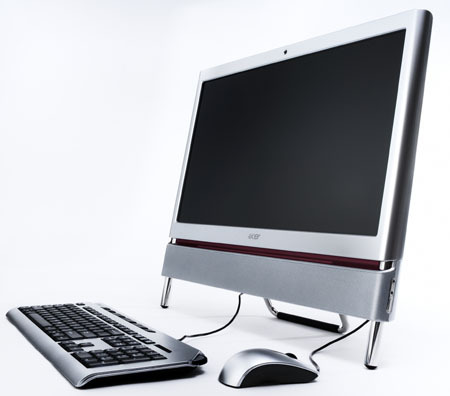 Enter Acer, with its Windows 7 all-in-one PC. The 24in Aspire Z5600 PC has supposedly been “engineered to maximise the full promise” of Windows 7 - whatever that is - focusing mainly on the machine’s touchscreen display. 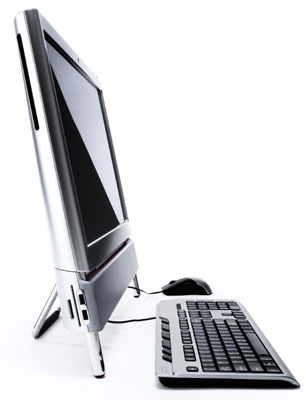 Acer’s supposed “miniaturisation of internal components” also allowed it to put all the Z5600’s hardware onto the rear of the LCD display, which appears to have resulted in an extremely streamlined PC. Full specifications are still a secret, but Acer has already confirmed that the touchscreen PC will feature the “latest generation of Intel processors” – mostly likely new Core 2 CPUs for thin'n'light laptops - and has guaranteed potential buyers up to 2TB of hard drive storage capacity. An unspecified graphics processor will also be included to ensure “optimum multimedia performance”, implemented on an MXM card, Acer said, suggesting it's an Nvidia GPU. The silver machine will also feature an integrated TV tuner, webcam and Blu-ray combo drive.